Take a ride in the most unique limo bus experience in Denver area; the black limo party bus. Literally a nightclub wheels, the black Limo Party Bus seats up to 40 passengers and comes equipped with iPod integration, sub woofer and amplified sound system, lasers, HD flat screen television(s), a disco floor and a full beverage disco bar. 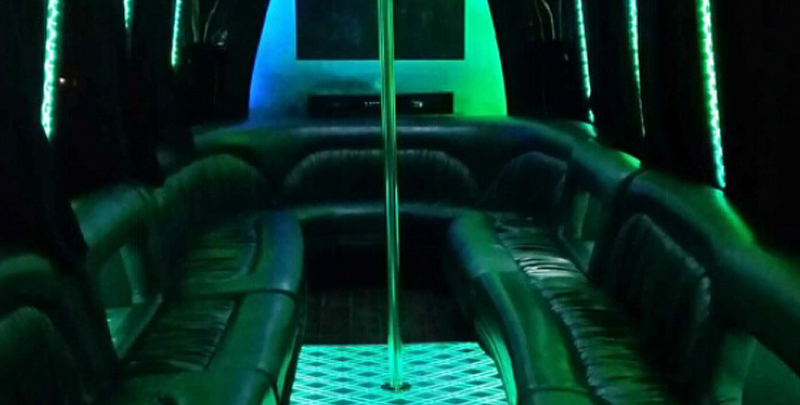 The black Limo Party Bus is an experience in itself. Why go to the club when you can ride in the club?! Perfect for birthdays, bachelor parties, bachelorette parties or just a wild night out in the Mile High City. Seats up to 36 passengers. 32 passengers for the most comfortable seating. For booking a REAL party bus, Sunset Limos will give you a free t-shirt when you rent a party bus! Sunset Limos does not provide iPod or smart phone cords.